To cross the border with Argentina, the documents accepted are - original ID, National Driver's License and passport, even for children of any age. To enter Paraguay and Argentina, children under the age of 18 must be accompanied by their biological and adoptive parents. If one of the parties is absent, it will be necessary to present an authorization registered at a notary's office and signed by the father and the mother, authorizing the child's entry into the neighboring countries. Iguaçu National Park entrance fee (Brazil side) - BRL 63.60. Brazilians pay half price. For tourists born in the Mercosur region, admission costs BRL 50.60. Children up to 11 years old have free admission. Iguazu National Park Entrance fee (Argentine side) - $600 pesos. Argentinians pay half price. For tourists born in the Mercosur region, admission costs $480 pesos. Children up to 05 years old have free admission. 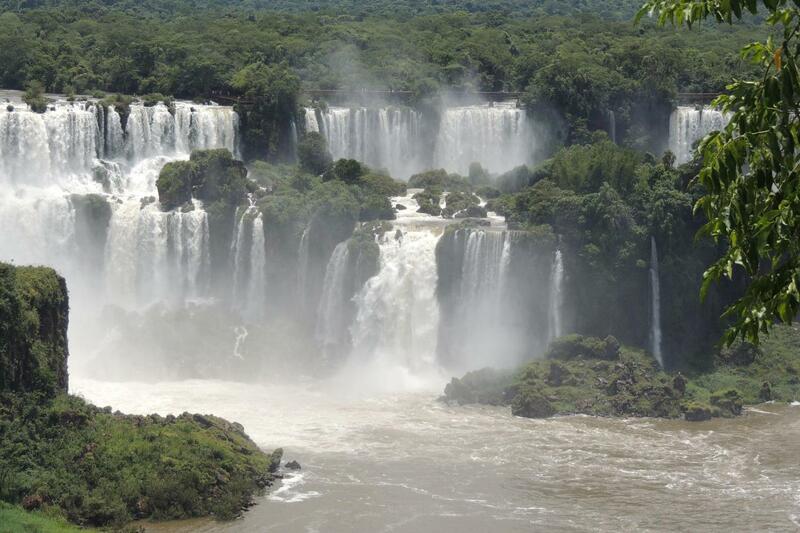 If you are leaving from Brazil, when you enter Argentina, you will need to pay a fee of $20,00 pesos for an Eco touristic tax in Puerto Iguazu. Please make sure to keep your receipt in order to avoid being charged twice. The above fees should be paid locally. Prices are approximated and subject to change without notice. Nothing in the world of water compares to, or is more impressive than the natural spectacle provided by the stunning group of 275 waterfalls that make up the Iguassu Waterfalls. The biggest waterfall is the “Devils Throat”, which is 90 meters high. The volume of water poured down creates a cloud of drizzling water that can be watched from kilometers away. Then the tourists return to the bus and head towards the Iguassu National Park. Embrained on the rocks with its 275 jumps, the Iguaçu Falls are the largest set of waterfalls in the world surrounded by the lush subtropical forest. The 01-kilometer course is done on foot with lookouts, lift bridges and souvenir shops. Wild animals such as the friendly Quati amuse tourists. Birds and butterflies give a special color to the place. After the visit to the Park on the Brazilian side, the passengers return to the bus that will take them to their respective hotels.